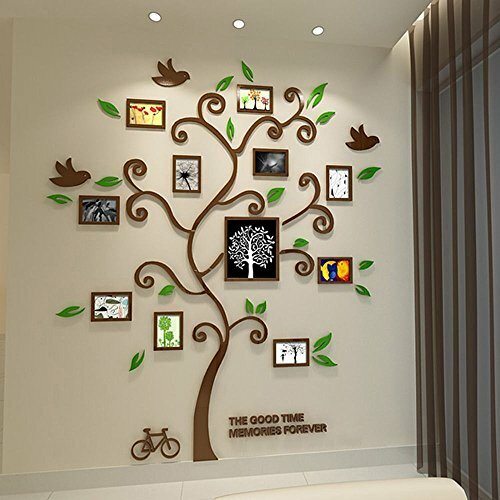 Location : Bedroom, Living Room, Wall Feature : Photo Frame Sticker Material : Acrylic Gross Weight/Package: 0.40 ( kg ) Category: 3D Photo Frame Including: 1-Set Dimensions: 146*175cm Due to differences in monitor settings, there may be a slight variation in color on screen,versus the actual material. 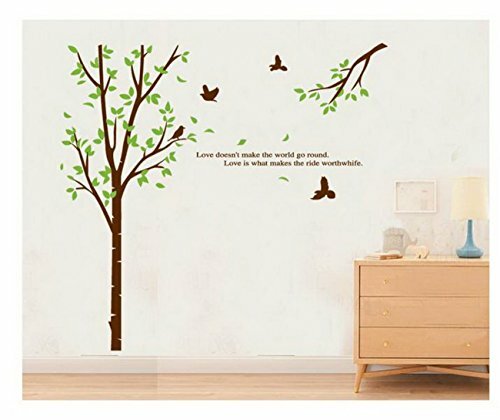 This wall sticker could improve your home decors and lead the trend. It is made of acrylic which is waterproof, mould proof & fadeless. It will make home much sweeter and more fashionable. It is also easy apply and safe and environment friendly. We are sure you will love it. 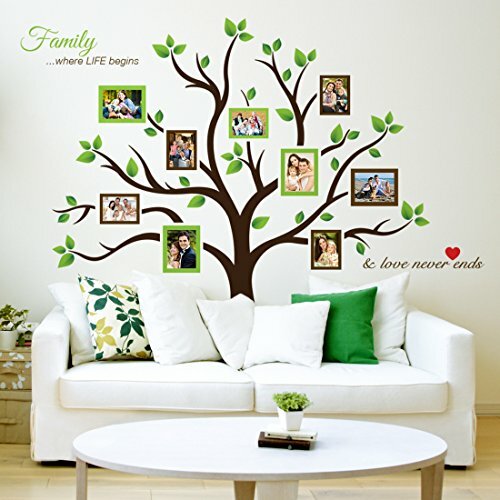 High quality wall art product, creates hand painted look on your wall. 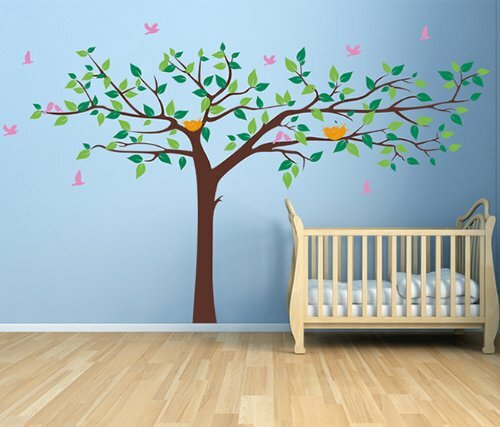 [Size] On the wall: 90inch(228.6cm)H * 133inch(338cm)W Colors: (As shown in the first image)Tree Trunk: Dark BrownLeaves: Spring green and leaf greenBird nest: Sunflower yellow Birds: Pink Decals can be applied on smooth and clean surface (walls, glass, doors etc). Do not use on textured walls (orange, sandy and grainy), fresh paint (less than 14 days) and low VOC (Volatile organic compound) paint. Returns are accepted within 60 days of purchase. Standard Amazon restocking fee applies. Returned item needs to be in unused/good condition. Original designs by Popdecors. 2010 Copyrights Protected. Package Included: 1* Vinyl Wall Decal (Some decals may come in multiple pieces due to the size of the design.) 1* Application Instructions Environmental Materials: GECKOO vinyl decals use only the highest quality materials and our decals are all made of a matte finish vinyl, so they look like painted or stenciled on the wall. Installations Steps: GECKOO vinyl wall decals are removable, but not reusable. Can be applied by using a credit card or any plastic squeegee scraper to smooth out the decal onto the wall. Please feel free to contact us if you have any installation questions. 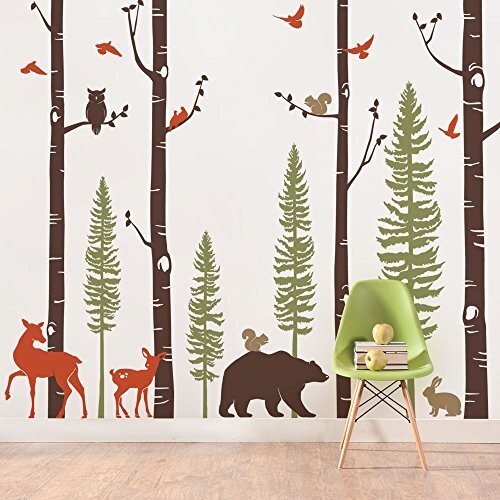 Attentions: Decals can be installed on smooth, clean, flat and dry surfaces, such as walls, windows, doors, mirrors, closets, plastic, metal, and wood. Wall decals are not recommended for textured wall. Shipping & Handing: We ship most of domestic packages via USPS priority mailing service, which takes 3-5 business days. International packages are shipped by USPS first class international mailing service, which usually takes 2-4 weeks to deliver. Guarantee : Our aim is to achieve 100% customer satisfaction. If for any reason you're not fully satisfied with your purchase please let us know and we will either send a new a new one or provide a full refund. 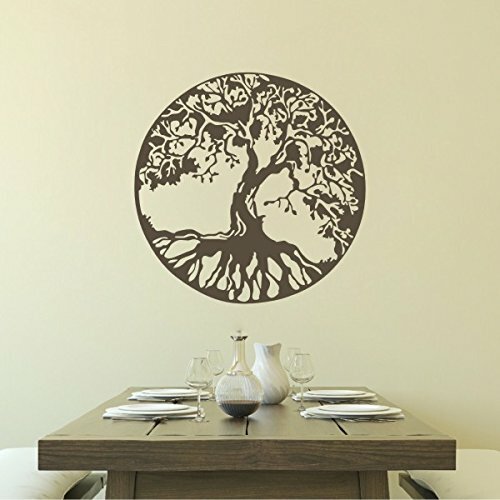 Tree of Life wall art - 7ft paper roll sculpture in 1 minute!!! 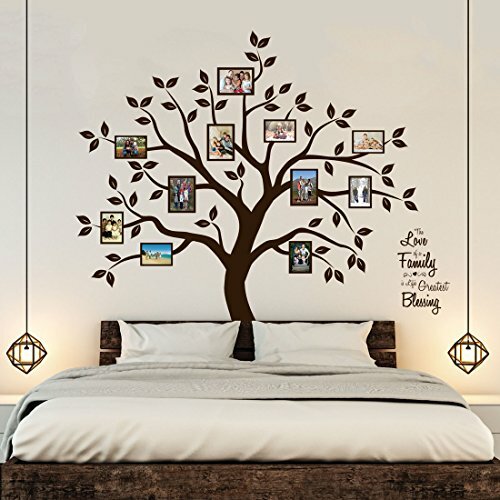 Compare prices on Tree Of Life Wall Decal Brown at ShoppinGent.com – use promo codes and coupons for best offers and deals. Start smart buying with ShoppinGent.com right now and choose your golden price on every purchase.